Huge facilities all over the world are now packed with Bitcoin mining hardware. A single facility near the Arctic Circle in Sweden boasts 45,000 machines running around the clock. Why? Well, if your computer finds the correct answer to a problem in computing a hash algorithm, your bitcoin wallet address is built into the answer with 25 more bitcoin. Also, your bitcoin address collects the transaction fees implicit in that answer. You get these additional bitcoin after 99 further blocks are built onto the system. Today, at $196 per bitcoin, the 25 new bitcoin are worth $4,900. So, there are good reasons to dedicate additional computing power to the task. As a result, bitcoin mining is one of the fastest growing sectors in information technology (IT) today. More computers are being added to the task all the time. As the blockchain grows, more bitcoin are added to the ones already in circulation. Over time, the rate at which new bitcoin are added is scheduled to slow down, until bitcoin mining is performed exclusively for the transaction processing fees when the system maxes out at 21 million total coins in circulation. Next year, 2016, the award for computing the next bitcoin block drops from 25 to 12.5. Will we see a drop in bitcoin mining activity? Perhaps. Already, the reduced exchange rate for bitcoins into dollars seems to be provoking some move toward consolidation in the industry. That comes at a time when bitcoin has again set a new record this month in the number of transactions occurring on a single day, over 105 thousand events. A fairly typical transaction fee of 0.0001 bitcoin is applied to many of these events, implying 10.5 bitcoin, or about $2,058 in possible transaction fee revenue for bitcoin miners. Thus, transaction fees may prove to be attractive to bitcoin miners even after the new bitcoin award begins to drop. Bitcoin mining began in 2009, using the basic Bitcoin mining software that is included with the original Bitcoin wallet software, with nearly any technically sophisticated user able to set up a computer to solve the mathematical puzzles involved. By early 2013, however, the first application-specific integrated circuits (ASICs), or bitcoin hash chips, began shipping. These chips are Bitcoin mining hardware that are only useful for mining SHA-256 cryptocurrencies, and make the use of ordinary personal computers, or networks of general-purpose computers, obsolete for Bitcoin mining. Although microprocessors in general double their power every 18 months according to Moore’s Law, the Bitcoin ASICs have been doubling their power every six months. This has led many to ask,”Is Bitcoin mining worth it?” The answer is complicated, and Bitcoin mining continues to be profitable overall, but you should always use a Bitcoin mining calculator to determine if it is right for you. It is estimated that hundreds of thousands of computers are focused on Bitcoin mining. Are bitcoin prices destined to fall further? It is hard to say. Certainly, they have had their ups and downs. Shortly before the Mt. Gox exchange failed, the USD to bitcoin exchange rate had peaked above 1 $1,124. The hacking of Bitstamp earlier this month may be responsible for some of the recent drop in the exchange rate. Of course, prices sailed up from mid-2012 to late 2013 without too many hiccups. The fork of March 2013 was one instance of a dramatic, but short-lived setback, when different versions of the bitcoin software caused a difference of opinion about the validity of certain blocks. Once consensus was re-established, the problem was resolved, and the valuation of Bitcoin continued to climb. Arguably, security at exchange sites has become an issue in the industry, as security in finance is always of paramount importance, with Bitstamp reporting 19,000 bitcoin missing in the hack. However, exchanger woes don’t tell the whole story. Many mainstream businesses, including Time, Microsoft, and Overstock are accepting bitcoin, though only Overstock is known to keep a portion of sales in bitcoin. Most merchants are using payment processing companies, such as Bitpay or Coinbase, that act as currency converters, to exchange bitcoin for USD. Still, acceptability may prove to be key in the advancement of bitcoin, since the more users are able to find places to pay with bitcoin, the more demand they will have for the available supply. Of course, bitcoin mining is not the only cryptocurrency mining taking place these days. Cryptsy, the largest altcoin exchange, lists hundreds of cryptocurrencies, with names like Litecoin, Dogecoin, Reddcoin, Darkcoin, Bitshares, and many more. Any blockchain currency with proof-of-work features may be mined, and miners in alternative cryptocurrencies seem to find the activity profitable. How much is all this equipment dedicated to bitcoin mining, and altcoin mining, worth? Based on a statement from Coinometrics about a 51% attack, there is about $833 million in mining equipment and electricity currently operational in the industry. The combined mining power on the network continues to increase. A large portion of Bitcoin mining is now cloud-based. Firms have been selling gigahashes per second, or Gh/s, for a fee, that provides enough computing power to make a billion attempts a second to solve the hash function for a bitcoin block. Genesis Mining, for example, charges $702 for one thousand Gh/s, plus a fee for electricity. If you happen to earn enough bitcoin from the 25 bitcoin created in each block, plus transaction fees, to surpass these fees, then renting the gigahashes was a good choice. Of course, given the enormous amount of computing power in competition with you, you should probably view the investment as speculative rather than as a sure thing. Bitcoin mining is energy intensive, so huge mining operations tend to locate where it is easy to keep machines cool or where energy is very cheap. Cheap coal in Mongolia seems to be stimulating bitcoin mining in that country. Unfortunately, not every bitcoin mining company has found a way to remain profitable. Recently, Ghash.io, one of the largest mining operations, announced that it would be suspending service until Bitcoin’s value increased, or mining difficulty decreased, enough to make Bitcoin mining profitable for them. Every 2016 blocks, or two weeks on average, the bitcoin network automatically adjusts the difficulty of the hash function depending on how much computing power is on the task. Difficulty could be adjusted downward if a great many miners began pulling machines off the net, but for the past couple of years the trend has been upwards. Since ASICs were first shipped the difficulty has increased by a factor of ten thousand. However, this is changing, as the recent drop in bitcoin’s price has caused so much mining power to be shut off. 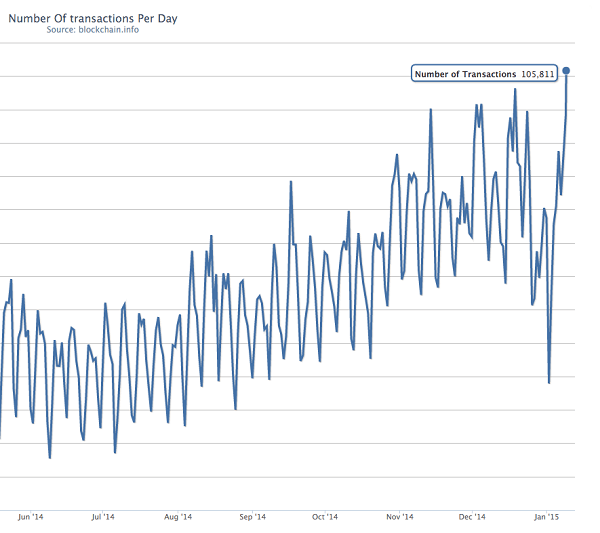 How does bitcoin mining stack up as far as transaction processing goes? The bitcoin protocol currently can only process seven transactions a second, because of the 1 megabyte limit on blocksize, which is tiny compared to, say, Visa, which handles up to 10,000 transactions per second. However, of course, the fee for each transaction is significant, especially for merchants who bear the brunt of the credit card processing fees. A recent transfer of tens of millions of dollars worth of bitcoin was recorded on the blockchain for a fee of about two cents. If bitcoin is going to enter the mainstream, the limit must be raised, or transaction fees must be significantly increased. Fortunately, the 1 megabyte limit can be changed, and the bitcoin mining network’s processing power is far greater than is necessary to handle however many transactions per second is required of it. Gavin Andresen, the Chief Scientist of the Bitcoin Foundation, as well as the primary developer working on bitcoin’s core protocol since the departure of the currency’s mysterious creator, Satoshi Nakamoto, has been experimenting with larger block sizes. His tests have shown that increasing bitcoin’s blocksize can be easily achieved, when that becomes necessary.